Hello all, I admit to being a bit rushed today due to finishing my research paper for my class. While I did set the final due date for the class, I shouldn't request an extension right? Yesterday was productive but I had hoped to finish the whole thing. Anyway I have the intro, background, and methodology done so now to just write the results....that I need to complete. Sigh. ETA: at 7:45 PM it is done and submitted! Happy Day! 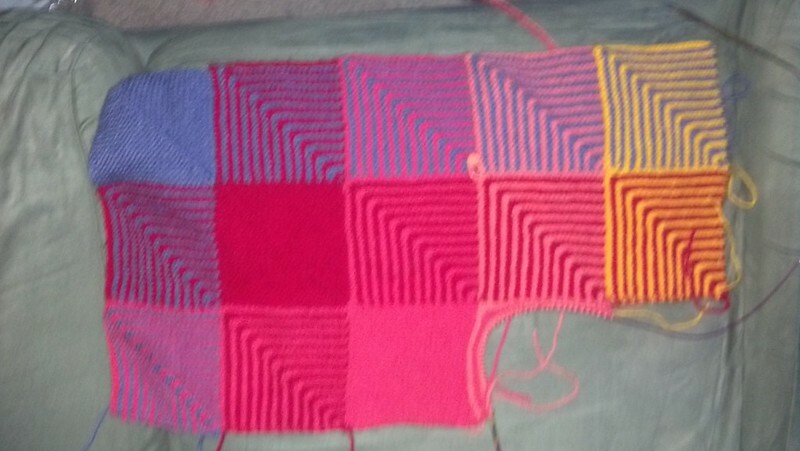 Well, I got as may ends weaved in as I could and then I started the peach and pink square. There isn't too much to see but I am glad to have gotten those ends weaved in. 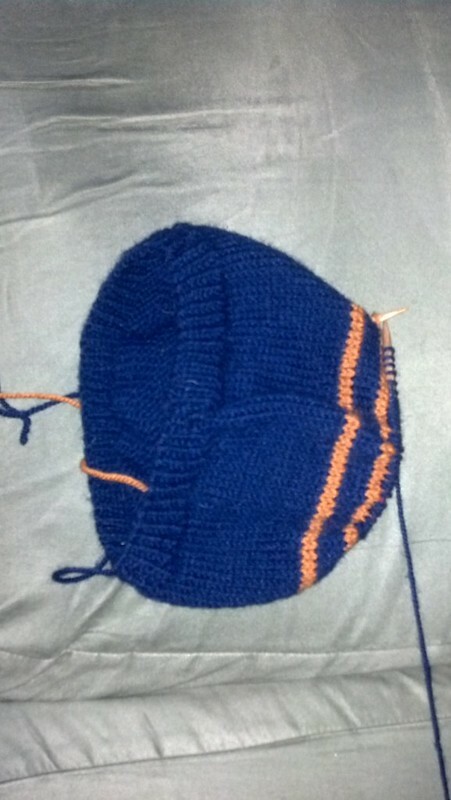 This has been such an easy and mindless knit that I really have gotten pretty far on it. I have a few rows left then I can start the decreases. Does anyone else find hat decreases fun? I think because your nearing the end and it's a visible change after the rows of stockinette. Well, that's it for this weekend, now onto the paper! The blanket is still holding my attention. Can't wait to see it progress. Thanks! I think now that my paper is done I can work on it again. Thanks! I love the colors too. Stylecraft is just great to work with. Yes, what Chrisknits said! Looking forward to seeing the progress on your beautiful blanket. thanks! It can have more of my attention now that school is done for the semester. Those mitered squares are so beautiful! I love the way the colors are working together. Oh thanks! I really like these guys and the garter stitch is so snuggly when it's worked into a blanket. Oh don't even get me started on all of the things that I'm not getting done, there are enough hours in the day! But you are in the home stretch now, you can do it!! If you get too stressed, just look at that blanket, it is sure to cheer you up with those colors! The blanket looks gorgeous!! Ends are not so fun, but it feels so productive to work them all in, doesn't it! I hope the rest of your assignment went ok! Heather has read 3 books toward her goal of 75 books. This is a Flickr badge showing items in a set called Blog - Yarn. Make your own badge here. Sandy's Space --Stories, Stitches, and sometimes Silliness!